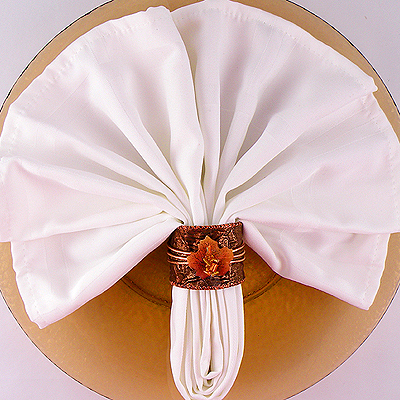 Thanksgiving napkin rings are a great way to add a festive touch to your table. They can be used at a place setting or displayed on the buffet table. Rather than buying napkin rings, I created a more economical version from tubes cut from paper towel rolls, covered with ribbon, leaves and beads. They are inexpensive and easy way to dress up your holiday table. This would also make a fun family craft project. You can use scraps of ribbon and accents you have on hand. Follow my instructions to make my version or be creative and come up with your own design. 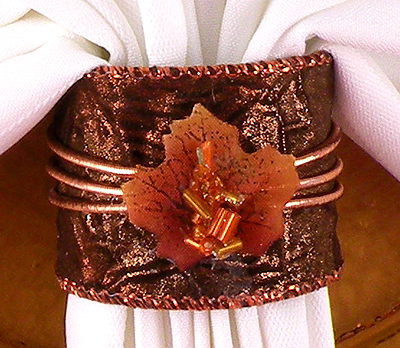 This entry was posted in Crafts, Uncategorized and tagged fall leaves, Gina Tepper, napkin rings, paper towel roll, Ribbon, table decorations, Thanksgiving. Bookmark the permalink.